Cartoon or not cartoon? More names. Today’s entries show the fault line that we’re all debating around our shop: do we continue in our ‘tradition’ of using “cartoon” in our name, or does it discourage more alternative filmmakers (like CG creators) from pitching us their storyboards? Any thoughts? Meet the composer: Guy Moon. I’ve been a huge fan of the cartoon music ever since I was a kid and realized there was a difference between Looney Tunes and Hanna-Barbera. I had an essay written once about the greatness of HB’s Hoyt Curtin (there was already plenty on Carl Stalling), and when I started making cartoons I vowed to pay special attention to the scoring, since I felt it was an essential ‘character’ in a film. So, every once in a while I’d like to pay homage to the great contemporary composers who work on Frederator cartoons. Guy Moon has produced more scores for us than any other composer; we met through Bodie Chandler, Hanna-Barbera’s music director, a great champion of new artists. Starting with The Addams Family, Guy went on to really prove his chops on the deceptively challenging What A Cartoon! shorts, which led to Cow & Chicken and Johnny Bravo. When we moved over to Nickelodeon Guy would hold the record for the most scores for Oh Yeah! Cartoons, and those in turn led to the lead chair on The Fairly Oddparents and ChalkZone, in addition to one of our movies, The Electric Piper. And Guy’s been no slouch working on other shows and films either. Whew! Growing up in Wisconsin, going to college in Arizona (loving Chick Corea’s Return to Forever), Guy and his family live in Los Angeles’ San Fernando Valley. Thanks Guy, for all your great work. I’m such a wuss that nothing I’ve ever been involved with could ever had a such a cool title. Until now! Oh Yeah! Cartoons alumnus and co-founder (with Julieann Hartman) of the Hartman House Foundation, Butch Hartman has a new video game out. The Fairly Oddparents are at it again in the THQ/Nickelodeon video game Clash with the Anti-World. Butch has figured out the perfect balance between his love of comedy and his love of adventure comics. Become a part of cartoon history, and win a buck in the process. As many of you know, we’re in production on 39 brand new short cartoons for our partners at Nickelodeon (their blogs are over in the right hand column). We’ve already done 99 shorts over the last 10 years; the first bunch for Hanna-Barbera and Cartoon Network were named What A Cartoon!, and the ones for Nick were called Oh Yeah! Cartoons. We’ve launched our effort for this new crop under the Oh Yeah! name (Season 4), but, the time has come to break it to our fans that we’re looking for a new name for our shorts series. And you (that’s right–you!) get to name the show. You send us as many ideas as you like (only to hey@frederator.kz). We’re going to post them all, with your name attached (unless you’d like to remain anonymous, which we’re happy to respect). You absolutely must include your email address and phone number, which will not be posted. If you do not, do not expect to see your entry posted ever. A winner(s) will be picked by October 31, 2005. The winner will receive $500, a credit on every episode, and of course, a chance for animation infamy. Remember, this is an ‘open source’ contest, and all the entries will be publicly posted; it’s possible the winning name will be a combination or morphing of another, earlier name. If the judges arbitrarily decide this to be true, said same judges will just as arbitrarily decide how to split the winnings between the affected entrants. Same thing for multiple entries of the same name; if it wins, we’ll decide how to split the winnings amongst you. The judges will be the current Frederator Studios staff, and our Nickelodeon partners. The winner(s) will be chosen on a completely whimsical basis, that is, the winning submission will be what we say it is. It’s not a drawing, not a judgement on the “best” name, we’re not throwing darts at our favorites. The name will be the name we pick for whatever reason we pick it, and that’s the story. OK, that’s it, you’re off to the races. Entries will begin posting tomorrow. Send your naming ideas to hey@frederator.kz and win $500. Frank Olinsky was the first artist I knew. Check that. Frank was the first person that made me aware that there was such a thing as an artist. He was brillant even then, and remains so today. He’s inspired me since we met when I was four years old, and I’m proud to still be his friend on his birthday today, 50 years later. Relevant to the subject of these blogs, when I was in the 4th grade, and The Flintstones hit the airwaves like a ton of quarry bricks 20 times more powerful than The Simpsons, Frank started making hand drawn Fred Flintstone sweatshirts. And it dawned on me that actual humans drew the characters, not some mystical, unknowable process. As we got older, Frank’s the guy who turned me on to all the newest pop music of the day. The Monkees, The Who, Jeff Beck, Frank Zappa, you name it, Frank was always there first. So, it was logical that I would turn to him to illustrate and design covers for my first record company, and then again, when I was fortunate enough to have the responsibility to create the look of the fledging MTV. By then Frank was part of a tiny design collective with enormous ideas, Manhattan Design, with two equally talented partners, Patti Rogoff and Pat Gorman, and together they toiled through hundreds of approaches to present to my partner, Alan Goodman, and me. At the last second, the weasels in sales almost killed the most famous design in modern media, but, we turned the tables and mowed ‘em down. Manhattan Design was a key element in defining the early MTV, and I’m sure the current design director, Jeffrey Keyton, tips his hat every day to their work. His first love was pop music, and Frank been one of the leading cover designers. And he does books, still illustrates, he teaches at Parsons, and he’s written a few books along the way. Frank Olinsky gave me my first shot at fandom, but certainly not my last. Frank, have a happy birthday, and thanks for everything you’ve done for me. Zee Risek runs Flying Iguanna Productions out of Montreal (where he also keeps his blog). Like me, instead of being in Ottawa this week, he was down in New York. He was considerate enough to come by our office and show us a number of ideas he’s been developing, including Toilet Puck. Zee had an entry in the Nextoons film festival, and I’m hoping we get to know each better and he bring us an Oh Yeah! cartoon. Thanks to Zee for his kind permission to post artwork from his storyboard. From Brian Wilson’s message board. 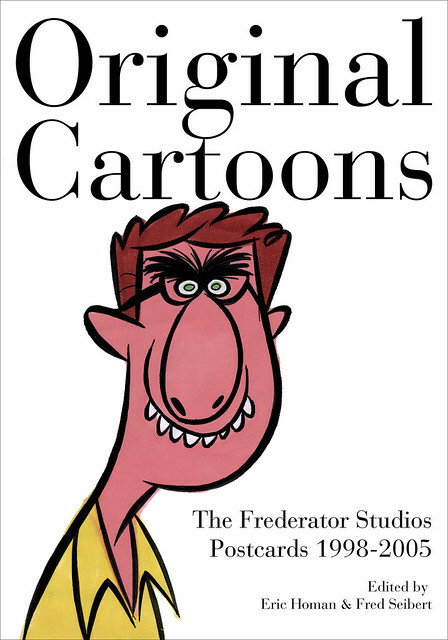 For the next two months we’re offering our site readers a special pre-publication offer on our first studio book: Original Cartoons: The Frederator Studios Postcards 1998-2005 (edited by Mr. Eric Homan & yours truly). There’s a $10 discount, and two free Frederator collectibles. Details can be had right here, or by clicking the button on the right. Or, you can just check the complete book below, or download a free electronic copy of the book here. As we’ve told you before, the book collects each and every one of the promotional postcards we’ve released over the last eight years, including each individual Oh Yeah! Cartoons card, hand drawn by the star creators who’ve been nice enough to do a short for us at Nickelodeon. And that’s not all! You also get a bonus chapter on the studio’s posters, and the posters we did at Hanna-Barbera for our first shorts show What A Cartoon!, including Dexter’s Laboratory, The Powerpuff Girls, Johnny Bravo, Cow&Chicken, and George&Jr., among others. And the essays are by Cartoon Brew’s (and Oh Yeah!’s) Jerry Beck, AWN’s Joe Strike, and the New York Times’ Steven Heller.The official release date is currently November 30, but hurry! and act now! This offer will not last forever! Oh Yeah! Joe Strike & JP Morgan. Joe Strike is a journalist and author, and JP Morgan is a comic artist. Together, they created Lamb & Lion, which they were kind enough to come and pitch to Oh Yeah! Cartoons. Thanks to Joe and JP for the kind permission to post some of their storyboard.